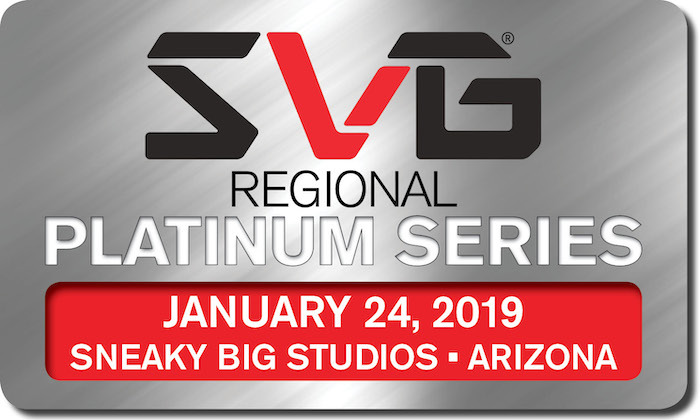 SVG is proud to present the next chapter in its Platinum Regional Series of events: SVG Arizona, which will be held on the afternoon of Thursday, January 24 at Sneaky Big Studios in Scottsdale, AZ. This event will feature a full tour of the state-of-the-art Sneaky Big production facility, a panel and a Q&A, and a closing networking reception that that aims to bring together the thriving sports-production community in the state of Arizona and surrounding areas. SVG Platinum Regional Series events foster communication, education, and networking among a specific regions’ broadcasters, pro franchises, universities, technology vendors, and other local production entities. SVG Arizona is the latest edition of SVG’s series of regional meetups following SVG Rocky Mountain (Denver), SVG West (Los Angeles), SVG Florida (St. Augustine, FL), SVG Toronto, as well as others. The SVG Platinum Regional Series is open to all end-users (video-production professionals working for broadcasters, leagues, teams, universities, digital outlets, etc.) and SVG Platinum Sponsor companies. To register, click HERE. The explosion of “at-home” productions in recent years has dramatically changed the face of the live-sports industry. While many networks and content creators are using their own facilities as the base for these at-home shows, third-party production facilities like Sneaky Big Studios are also playing a larger role in this evolving ecosystem. A group of at-home-production pros take the stage for this session addressing REMI best practices – whether you are using your own broadcast center or a third-party facility. SNEAKY BIG has dedicated underground parking structure as well as a number of surface spots on the front/side of the building. Surface lot: Please enter the lot on the SOUTH side of the building and park in any available surface spot. You will enter the building through the main entrance doors on the EAST side of the building. Underground lot: Entrance to the parking garage is located at the SOUTHWEST corner of the building where you are free to park in any available space. Elevators are located in the center of the garage. You will exit the elevator on LEVEL *1. There will be elevator and directional signage throughout the building. Attendees will register in the SNEAKY BIG lobby. There will be a table near the front door. Once registered, they can take the stairs to the SNEAKY BIG Loft where the panel and Q&A will take place. Elevator is also available if necessary. SVG also invites to attend another event to be held earlier in the day at the the Conservatory of Recording Arts and Sciences, known as CRAS. For more information and to register, click HERE.